Uttapam! What will those Tamils think of next? I liked my last taste of East Asian non-traditional savory snack pancakes so much, that I went out this week and tried another one. 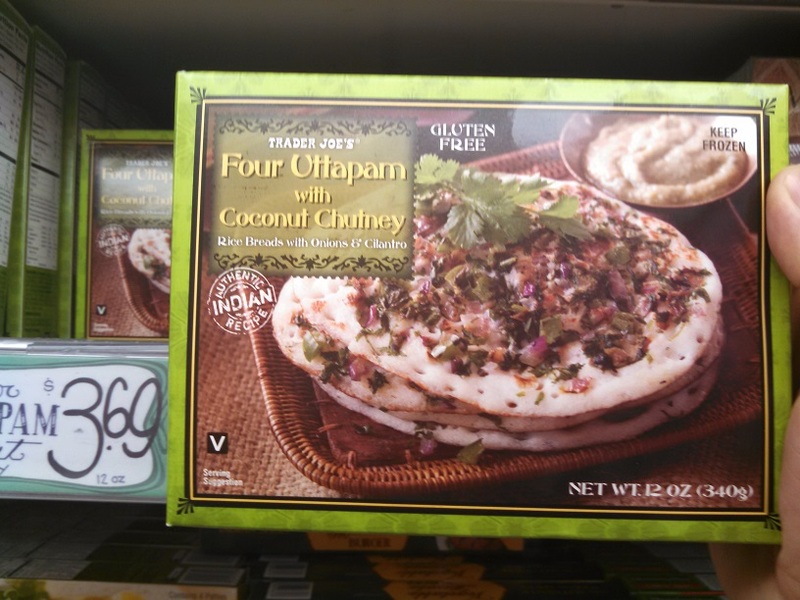 This time we’re talking about Trader Joe’s Four Uttapam with Coconut Chutney – a South Indian flat bread that’s not only vegan and gluten free, but also down right tasty. 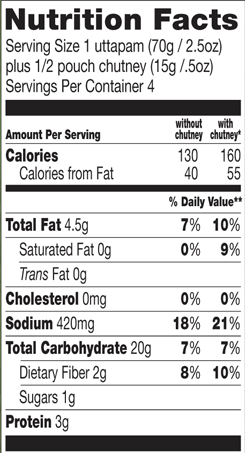 I’ll admit right out that I picked up Trader Joe’s uttapam because reading the package made the language part of my brain have a little spasm. As we’ve seen time and time again, if you put a crazy enough word on your package I basically can’t stop myself from buying your product. In this case, it turns out that uttapam (U-thap-pam, apparently) are smallish, plain pancake/pizza-like flatbreads from the south of India. Each uttapam is about the size of a bagel (a bit smaller than the Pa Jeon) and topped with a healthy scattering of diced onion, green bell pepper and some subtle cilantro. The taste is a mild, but rich with both the flavor of the vegetables and a dusting of traditional Indian spices. These veggies are all resting on the uttapam itself, a very specifically Indian sort of bread – both doughy, spongy, and slightly sour. I put bread in “quotes” here because the dough is made from a specific mixture of mashed, fermented rice and black lentils called urad dal, which are not things you typically imagine bread as being made out of. In fact, I’m fairly certain urad dal is one of the locations Frodo and Sam had to pass through on the way to Mordor. You might think that a bread made from rice and beans would taste wildly different from a standard wheat-based flatbread, but shockingly that isn’t the case. The spongy, soft bread base tastes just as good, as any wheat based flat bread – only due to it’s rice and lentil origin it’s miraculously gluten free. Yeah, Britain – the Indians saw your English Muffins and they weren’t impressed. directly, or get fancy with some toppings. Trader Joe’s includes a couple little packets of coconut chutney to throw on top, but I’d recommend throwing them out instead. The included chutney is rather weak and lackluster, and doesn’t do much for the subtle flavors already present in the bread. Instead, I’d recommend applying your imagination and topping them with whatever seems good – be that a better chutney you have laying around or some other food entirely. 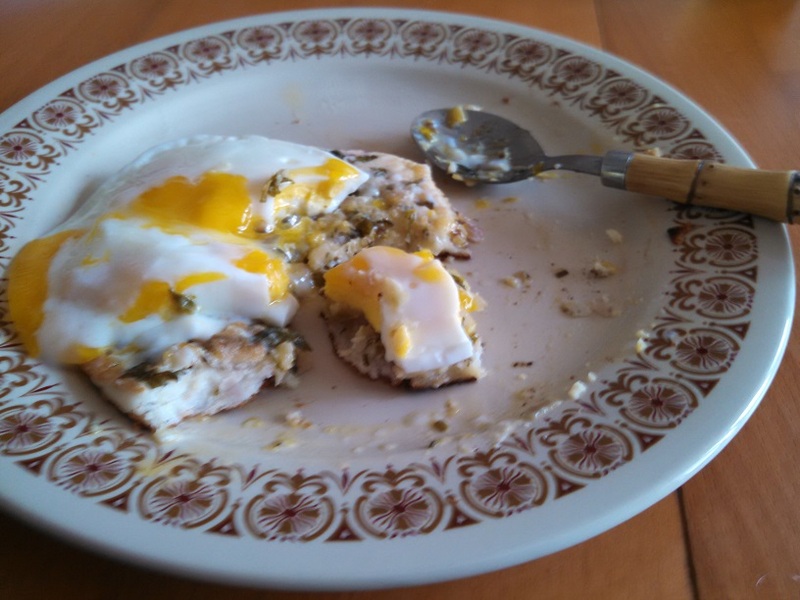 I threw some fried eggs on mine one morning and discovered that uttapam beat the hell out of English Muffins. At $3.69 for a pack of four, you can afford to get a little crazy with them. Your box of four uttapam comes frozen, and Trader Joe’s offers two suggestions for cooking them – either microwave or stove top. This is no idle consideration, because each method yields a very different final result. Microwaved uttapam (net time required: < 1 min) stay soft and pliable and more pancake-y. Stove top, on the other hand, takes about 4 or 5 minutes per uttapam, but comes off the griddle toasty crisp. Having tried both, I’d recommend the stove top without hesitation – not just because the creators of the uttapam, the Tamils, have a culture of enjoying elaborate and leisurely cooking – but also because the time on the stove really brings out the redolent smells and flavors of the dish. Really, I have to consider myself a lucky guy – just two weeks ago I couldn’t name you a single tasty, simple, vegetarian/vegan, super-snackable, savory mini-pancake, and now I know two. I’d recommend picking up the uttapam and pa jeon at the same time, and having yourself an Asian Pancake Frolic to go along with the waffle frolics you are enjoying already. At the very least, they could serve as a decent stand in for those still feeling the pain of loss of Arabian Joe’s Spicy Spinach Pizzas. Would I Recommend It: Yup – it’s as tasty as it is worldly. Would I Buy It Again: I most certainly would. Final Synopsis: Tasty south Indian flatbread perfect for gluten-eaters and gluten-free alike. I’m vegan and was super impressed with these!! Had one (made stove top) along with a quick chickpea salad with lots of veggies and was thrilled.